An active, compact, short-coupled and well balanced dog, well knit in frame, with tail carried well over the back. Skull flat and broad, with little stop, well filled out under the eyes. Muzzle moderate in length, broad from the eyes to the point (not pointed at the end like a fox). Nose black, large and wide in all cases (with the exception of cream and white in which case a light-coloured nose is permissible and in blues and fawns a self-coloured nose); but in all colours a black nose is preferable. Dark and small, preferably almond-shaped (in blue or fawn dog a light colour is permissible). Small, thick, slightly rounded at the tip, carried stiffly erect but placed well forward over the eyes and wide apart, which gives the dog the peculiar characteristic expression of the breed, viz., a scowl. Teeth strong and level, giving scissor bite. Tongue bluish black. Flews and roof of mouth black. Gums preferably black. Chest broad and deep. Back short, straight and strong. Loins powerful. Hindlegs muscular and hocks well let down and perfectly straight which are essential in order to produce the Chow's characteristic gait. Abundant, dense, straight and stand-off. Outer coat rather coarse in texture and with a soft woolly undercoat. 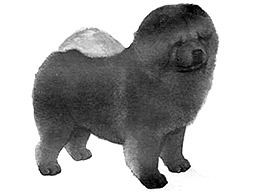 The Chow Chow is a profusely coated dog and balance should therefore be assessed when the coat is at its natural length. Whole coloured black, red, blue, fawn, cream or white, frequently shaded but not patches or parti-coloured (the underpart of tail and back of thighs frequently of a light colour). Minimum height for Chows to be 46 cms (18 ins) but in every case balance should be the outstanding feature and height left to the discretion of the judges. The Standard of the smooth variety is identical with the above except that the coat is smooth.